Ecuador, 1 country that comprises 4 different regions. Great weather throughout the year. Huge diversity in wildlife, ranking among the highest bio-diverse countries in the world. The most bio-diverse country per land area in the world. Home to about 7% of the total known plant species, & more then 11% of land vertebrates. Relatively small country, (272,045 sq km) offering adventure packed tours with short travel. A birding paradise with about 1600 bird species, many of them been endemic. Home to one of the world wonders, the Galapagos Islands. (City of Quito – 1978) The best-preserved, least altered historic center in Latin America. (Galapagos Islands – 1978) 19 islands & the surrounding marine reserve, a unique “living museum & showcase of evolution”. (Sangay National Park – 1983) The park illustrates the entire spectrum of ecosystems, ranging from tropical rainforests to glaciers, with striking contrasts between the snow-capped peaks and the forests of the plains. 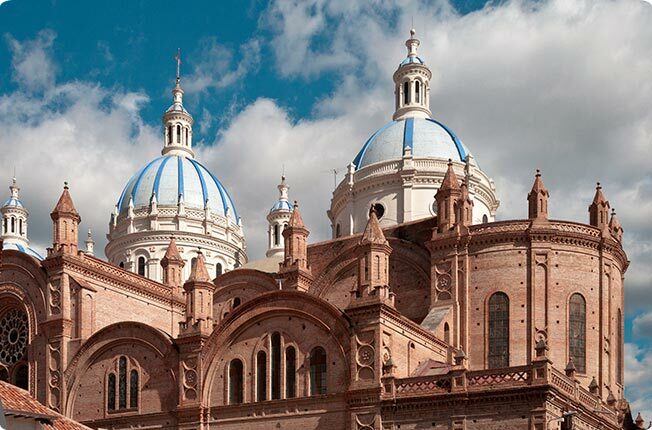 (Historic Center of Cuenca – 1999) Founded in 1557 on the rigorous planning guidelines issued 30 years earlier by the Spanish king Charles V. Cuenca still observes the formal orthogonal town plan that it has respected for 400 years. The Amazonian basin holds biodiversity and nature like no other place, you will be fascinated as you enter into another world surrounded by green vegetation and home to exotic wildlife. Amazon lodges and Cruises offer you a front row seat to this amazing ecosystem that doesn’t cease to amaze its visitors, have a look at the different lodges located in several regions of the amazon, make your pick and let us take care of the rest. Cloud forest’s & Spa’s are the perfect getaway to get lost in the wilderness and tranquility of nature, rustic and modern retreats will seamlessly blend with your surroundings that will make you feel like at home in the midst of a remote and soothing location. Lodges & Spa’s main objective is to create a refreshing and invigorating atmosphere perfect for nature lovers or couples looking for a remote and intimate location. Complimenting your surroundings you will find additional services that vary per retreat, private hikes with birding or natural experts, to a variety of spa treatments. Day tours are a great way of acclimatizing to your surroundings and filling in between days before or after your longer tours. There is a wide range of day tours that can be arranged from Quito, the capital is strategically located to offer many day tours in the surrounding areas. Other regions might be more limited in the amount of day tours that can be offered. Day tours are also a great way of having an overall detour of a certain location without necessarily having to commit more then a day, perfect for travelers with limited time. The very best destinations of Ecuador – all under one roof! our Ecuador trails (both short and long) are prearranged tours catering to themes such as mountaineering, couples getaways, natural retreats and much more! These have been carefully put together by locals that have literally traveled all around the country and know how to do it in the best way. Our prearranged tours can be used as a canvas, as a starting point per say, these can be completely customized and personalized to your liking and needs, let us know what you have in mind and we will work together to build your perfect Ecuador Trail! World known for its unique habitat, tameless wildlife, mind blowing landscapes and volcanic scenery, the Galapagos Islands are a dream holiday and a once in a lifetime trip. There is a variety of ways you can approach the Galapagos, browse through the different ways you can get to know the islands, you’re only a few clicks away! One of the true beauties of Ecuador highlands is that they can cater to a broad range of travelers and count with easy access from nearby provinces where visitors can quickly get started with their scheduled activities. From Refuges and Parks that can be reached as day tours to appreciate the extraordinary view, to low peaks that can be used as introductory and acclimatizing programs for novice climbers, the highlands of Ecuador offer a unique introduction to climbing aficionados. For experienced mountaineers more demanding peaks like Chimborazo among others provide climbers with a remarkable climbing experience. Looking for that one stop where you can awake to the breathless view of the Andean highlands, and be put to sleep with the crashing of waves against the shore, or the sounds of crickets and frogs at night? look no further, Ecuador is a small little gem in South America that offers an unlimited amount of expeditions, tours, trails, markets and so much more, the only limit is your imagination. With 4 different regions found in Ecuador, the amount of diversity per land area is astonishing, it actually tops the list world wide. Nature rich destinations are found at every turn in Ecuador, it’s not uncommon for past visitors to return for more, and you often hear them saying that time spent in the country wasn’t enough. Ecuador is without a doubt a must stop if you are considering a visit to South America, come and be part of all that Ecuador has to offer. The coastal region of Ecuador covers a third part of the country, its beautiful beaches, distinctive cuisine & warm weather all contribute to the high demand it has for locals coming from all over the country in weekends & holidays. Easily accessible by plane arriving to Guayaquil, Manta or Esmeraldas, the coastal region is the perfect way of complimenting your visit with surfing, whale watching or just enjoying yourself with some good old beach time. With countless destinations to cover in the country, expeditions are only as good as you want them to be, some typical combinations are: (Galapagos & Amazon) the perfect combination for wildlife & exceptional nature. (Quito Surroundings & Cuenca) Historical Centers at their best. (Avenue of the Volcanoes) an exhilarating and rewarding experience. (Beaches & Whale watching) Nothing beats sun and sea. (Cloudforest & Spa’s) An invigorating and refreshing getaway. These are only but the most popular destinations to get you started. Weather in Ecuador is one of the main reasons why the country is so abundantly blessed with nature & wildlife. Its strategic location & altitude play an important role in determining the many micro-climates found throughout the country, most of the highlands cities have a somewhat similar weather pattern. On the east & west side of the Andean Slopes a subtropical & humid climate is predominant but rainfall is completely variable. There are no set climate seasons in the highlands of Ecuador, geographical location is the main determining factor, but the overall weather varies greatly. what comes closest that could be set as a pattern indicator is the dry season (June to September), & the wet season (October to May). December & January are a hit & miss where either season can occur or a mix of both. In general weather in Quito holds a steady cool climate from 14 to 19 Celsius on an average day, & drops to about 10 Celsius at night, rainfall is a different story and can happen at any time, Quitenos know better & its not uncommon to see them carrying their jackets & umbrella in a sunny day. The coastal region with its subtropical weather boosts a warm & a rather welcoming climate all year round, befitting for the amazing & beautiful beaches found along its coastlines, the water as to be expected is warm & adds to the overall enjoyment. Climate seasons are not exact & vary somewhat with an average temperature of 22 to 27 Celsius on a regular day based on your coastal location. 2 seasons are to be expected in the coastal region, the Wet-Hot season (January to May) good sunny mornings in all their splendor, followed by regular afternoon rainfalls. Dry Season (June to December) is regularly met with cloudy-grey & misty mornings, and in most cases the sun shines brightly well into the day. The rainforest as represented by its name has rainfall all year round, the intensity & frequency does however change during the year, this shouldn’t be a deciding factor when entering the amazon as wildlife & vegetation don’t vary significantly. (May & June) start displaying heavier rainfall reaching its peak months in (July & August). (Mid September to December) would be considered the driest months with light & less frequent rainfall. (January to April) rainfall is rather steady. Benefits of traveling with higher rainfall are healthy high streams in rivers reducing time travel in canoes, and lighter rainfall translates to better hiking terrain for manageable treks. Sustainable travel is easier then you think, guidelines in general are instinctive principles that many people do while traveling without even knowing they are supporting the local population & carrying out a neutral travel. A green travel shouldn’t be a check list of things to follow making it dull & tiresome, but it should rather compliment your visit, providing you with a sense of accomplishment & happiness – that you did more then just visit a certain area, but actually supported & participated in making it a better place. Don’t think of this as homework, but as a sneak preview of whats to come, pick up a good book, read some travel guides, see a movie or a documentary about the country, anything that can build up to the excitement to plan your trip. Ecuador is a fascinating country, rich in nature, culture with many customs from food to colloquial sayings, remote communities & much more. The more informed you are of the country, the easier it will be to plan the destinations you want to visit, avoid unnecessary travel, keep your expectations real, support rural destinations with your visit & much more. This can be easy for some & tasking for others, think of it this way – pack essential items that are a must to carry with you in your trip & unlikely to be found abroad, such as electronics, guidebooks, medicine etc. Avoid having excessive luggage out your door, all other things can be purchased along the way, you would be supporting the local economy, local businesses & families that sell clothing & other local goods & souvenirs for a living. Even the simplest of things such as choosing one tour over the other can increase your chances of having a sustainable neutral travel. Ecuador has had great progress in this regard and a lot of Amazon, Highlands & a few Galapagos cruises are environmentally conscious, following good practices, keeping to a bear minimum human impact in the area. Many lodges are owned & operated by local communities, no one better suited to protect their regions then themselves, where natural resources are conserved, looked after & cared for. There is no better way of getting prepared and build up the excitement to your once in a lifetime dream holiday then viewing, researching & reading material about Ecuador. From documentaries to books, there is a wealth of information available about Ecuador, & we have listed some worthy mentions below. Looking for some general knowledge about the Amazon? you’re almost there!